Interest rates for fixed mortgages moved higher for a second consecutive week while rates for adjustable mortgages tilted lower according to Freddie Mac’s Primary Mortgage Market Survey® (PMMS) for the week ending February 27th, 2014. Interest rates on fixed rate mortgages were higher again this week with the 30-year fixed rate mortgage increasing by four basis points to an average of 4.37 percent with an average of 0.7 points. Last week the average rate increased by five basis points. 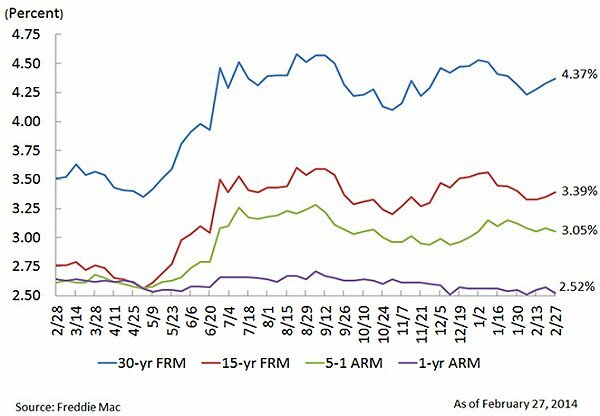 A year ago, the 30-year fixed rate mortgage averaged 3.51 percent. Average 30-year fixed rates were generally the lowest in the Western portion of the United States where mortgage rates averaged 4.32 percent while the highest rates were reported in the Southwestern and North Central areas of the country where interest rates averaged 4.41 percent. The average rate for a 15-year fixed mortgage was 3.39 percent this week with an average of 0.7 points, up from an average of 3.35 percent the previous week. At this time last year, the 15-year fixed rate mortgage averaged 2.76 percent. Interest rates for adjustable-rate mortgages were lower this week with the 5-year Treasury-indexed hybrid ARM averaging 3.05 percent, with an average of 0.5 points, down from an average of 3.08 percent last week. The 5-year adjustable rate mortgage averaged 2.61 percent a year ago. The 1-year Treasury-indexed adjustable rate mortgage averaged 2.52 percent with an average of 0.4 points, down from last week’s average of 2.57 percent. A year ago, the 1-year adjustable rate mortgage averaged 2.64 percent.